Bellingham, located on the northern edge of Puget Sound, is the county seat of Whatcom County. The city is situated on the shores of Bellingham Bay in northwest Washington State beneath towering Mount Baker, just 90 miles north of Seattle and 50 miles south of Vancouver, B.C. Enjoy wilderness, whales, waterfront, marinas, rich local history, and accommodations for every taste and budget. Whatcom County serves as a major connection to Alaska, the San Juan Islands, Canada's Gulf Islands, and the Mount Baker-Snoqualmie National Forest. The city's numerous parks and nearby lakes offer many outdoor activities. The Mt. Baker National Recreation Area lies within easy driving distance. 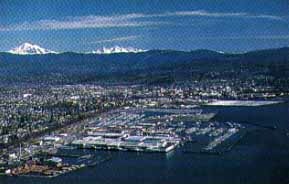 Today, Bellingham has an active waterfront port that supports fishing, cold storage, boat building, shipping, paper processing and marina operations. Bellingham is also home to Western Washington University. Bellingham is part of the Bellingham, WA metro area.